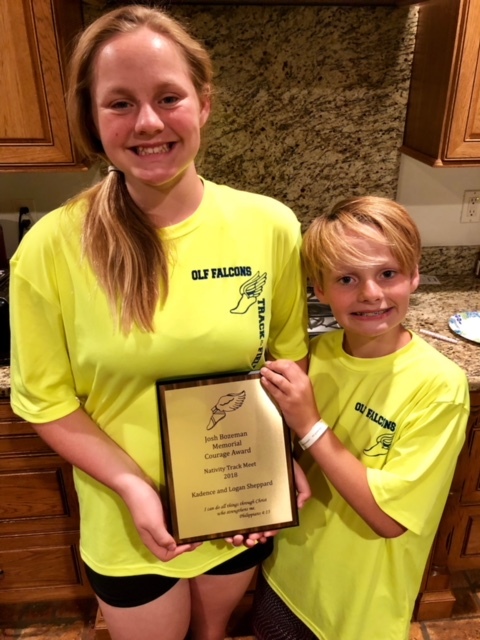 Two students at OLF Elementary were presented with the Bozeman Courage Award at the annual Catholic School Track Meet held at St. Patrick High School. Kadence, a 6th grader at OLF Elementary, and Logan, a 4th grader, were presented the award for their strength in dealing with the sudden death of their father, Wesley, in 2016. This annual award is to honor the memories of Joshua Bozeman and his five fellow classmates who died in a car crash in 2006. They were all graduates of Mercy Cross High School and were attending college at the time of their deaths.